WHO Is It For? Dr. Alfred Tomatis demonstrated that by listening one can improve balance, coordination, fine and gross motor skills, sensory integration, reading, writing, spelling, communication, attention, memory, organization, body energy, self-confidence and self-awareness. This is done with the Voice-Ear-Brain connection. The EnListen® Listening Program allows one to listen in the comfort of their own home, while incorporating the Voice-Ear-Brain connection established by Dr. Tomatis and Ms. Davis. This program fits into the “Trunk” portion of The Tree of Sound Enhancement Therapy®, the flow chart for The Davis Model of Sound Intervention®. WHAT Is It? Developed by Dr’s Billie and Kirk Thompson, EnListen® is designed to provide a listening program focusing on the relationship between the voice, the ear and the brain with today’s enhanced digital sound technology through a computer. WHEN Is It Used? When someone can only use a home-based program due to distance or time constraints, or as a follow-up to an in-office Tomatis® program. All clients must have had the Diagnostic Evaluation for Therapy Protocol (DETP®) as the entry level. WHY Might I Use It? The EnListen is recommended when there is a need to stimulate overall development or a desire to enhance personal growth. 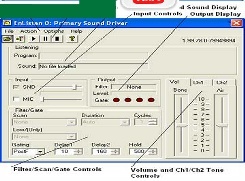 Areas in which listening programs such as the EnListen has demonstrated improvement include: communication, attention, memory, organization, sound sensitivities, auditory and perceptual skills, motor function, language skills, learning and comprehension, sensory integration, coordination, musical expression and rhythm, socialization, and self-confidence. The EnListen program supports foundational change with these skills. WHERE Is It Offered? The EnListen home program can be leased through The Davis Center.